Where do your gizmos go to die? You are staring right now at a computer screen, one of the gaggle of can’t-live-without state-of-the-art electronic gizmos you cherish for a year or two then discard. These electronic must-haves provide a new type of not-so-durable consumer product complete with built-in obsolescence. The perpetual technological turnover underpins the cash turnover of e-companies everywhere. Whether the resulting tsunami of e-crap stems from fashion – you just have to have that new i-phone, it’s soooooo cool – or from the inescapable upgrades, a product that started its e-life in a cleanroom, free of even a speck of dust, is destined to end its days presenting a serious toxic hangover. Each new gadget is e-waste in waiting, and the waste from this disposable technology is, perversely, shockingly durable. Some is dumped, but increasingly it is destined for the virtuous-sounding fate of “recycling”. Sometimes the recycling workers paying with their health, from India, to China, to Africa, have little choice but to undertake this work for a pittance. Sometimes, they have no choice at all, like the prisoners poisoned in the USA’s prison industrial complexes. The California-based Silicon Valley Toxics Coalition says the problem extends from this use of prison labour on its own doorstep, to the developing world – it estimates up to 80 per cent of the USA’s e-waste, like that from other wealthy countries, is exported to “impoverished nations”. The Basel Action Network, a group campaigning against toxic exports, says e-waste is the fastest growing part of the waste stream in the US. But of the e-waste that is collected by recyclers, 50 to 80 per cent of that is not actually recycled, but is exported to developing nations where it is handled in very crude and dangerous ways that expose workers and communities to toxic materials. And it is a problem destined to worsen, as production – and disposal and recycling – of electronics products accelerates. A recent study by consulting firm Deloitte estimated mobile phone waste is already growing by 9 per cent every year. 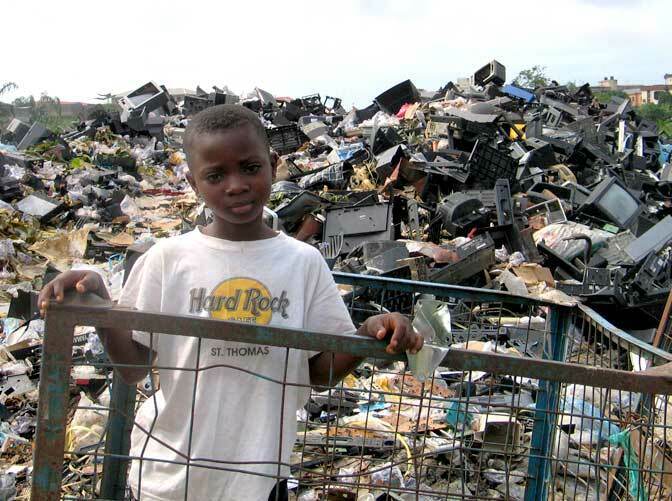 According to the United Nations, 20-50 million tonnes of electronic waste is produced every year. It amounts to a major toxic headache. The international Electronics TakeBack Coalition (ETBC) estimates over 1,000 materials, including chlorinated solvents, brominated flame retardants, PVC, heavy metals, plastics and gases, are used to make electronic products and their components—semiconductor chips, circuit boards, and disk drives. It adds that a computer screen can contain between four and eight pounds of lead alone. Big screen TVs contain even more than that. Flat panel TVs and monitors contain less lead, but use mercury lamps. About 40 per cent of the heavy metals, including lead, mercury and cadmium, in landfills come from electronic equipment discards. But e-waste recycling, the standard green solution, is a highly toxic process in its own right. And conditions in the industry are as distant from the cleanrooms where the products were created as the landfills – dumps – they might otherwise occupy. The campaign says to achieve that requires three steps by consumers: Make socially responsible purchases; recycle your electronics responsibly: and support laws to make companies responsible for their toxic trash. But when it comes to new products – and there’s always another newer, more efficient, faster, greener, cooler product on the blocks – socially responsible purchasing is not an option made available, at least in good time. The product and the pursuit of profit that usually drives its development comes a long time ahead of any real consideration of that product’s lifecycle, particularly when companies are allowed to say “so long, sucker” once the cash has been prised from your grasp. We should know better. Asbestos was a “miracle fibre.” It’s now the biggest industrial killer of all time. Computers came along with the toxic plastic casing crammed with toxic chemicals and toxic metals. Within a working generation it was clear the workers who produced them got sick, developed cancers, had reproductive problems. The disposal headache is the next piece of the life-to-death story of this very modern product replete with very old hazards. And we continue to repeat the same old mistakes for the same old reasons. One study has already reported deaths in Chinese nanotechnology workers. It’s probably only a matter of time before the price of nanoproduction, like asbestos and surely like the developing electronics waste crisis, is measured in lives, not money. This entry was posted in Uncategorized and tagged Basel Action Network, e-Stewards Network, Electronics TakeBack Campaign, makeITfair, Silicon Valley Toxics Coalition. Bookmark the permalink. Post a comment or leave a trackback: Trackback URL.